A study by the World Health Organization's senior radiation advisor Dr Keith Baverstock, completed in 2001, suggested that the use of uranium weapons in Iraq could pose a unique health hazard to the civilian population. The publication of the study was suppressed by the World Health Organization's hierarchy and only in February 2004 the UK Sunday Herald broke that story. At the time, the WHO's Dr Repacholi, a corrupt scientist known for his role in hiding any damaging effects of mobile phone radiation on humans and animals, denied that there had been any interference with the report, saying “The IAEA role was very minor,” but the study titled Radiological toxicity of DU which could have saved countless lives in the Middle East, had indeed never been published. Fast forward to December 2007: Health professionals are CALLING FOR INDEPENDENCE OF THE WORLD HEALTH ORGANIZATION. 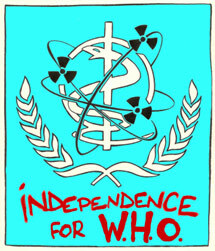 APPEAL BY HEALTH PROFESSIONALS FOR THE INDEPENDENCE OF W.H.O. To Madam Chan, Director-General, WHO and __________________ Minister of Health of _______________ (country). The World Health Organization (WHO) works towards the resolution of public health problems and to this end, it is mandated “to assist in developing an informed public opinion” (WHO Constitution, 7 April 1948). However, since the WHO/IAEA Agreement (WHA12-40) was signed on 28 May 1959, the WHO appears to be subordinate to the International Atomic Energy Agency (IAEA). As health professionals, we support the request that WHO, in line with its constitution, recover its independence in the area of ionising radiation. In the past, WHO was paralysed in its struggle against passive smoking because it was infiltrated by the tobacco lobby. In the same way, WHO is paralysed by the nuclear lobby, incomparably more powerful, represented by the IAEA, at the top of the UN hierarchy. This agency reports to the UN Security Council where it coordinates the promotion of commercial nuclear energy. The other UN agencies and the WHO report only to the UN Economic and Social Council. The principal statutory objective of the IAEA is “to accelerate and enlarge the contribution of atomic energy to peace, health and prosperity throughout the world”. The WHO/IAEA Agreement stipulates that “Whenever either organization proposes to initiate a programme or activity on a subject in which the other organization has or may have a substantial interest, the first party shall consult the other with a view to adjusting the matter by mutual agreement”. The Agreement also provides (Article III) for the application of “certain limitations for the safeguarding of confidential information”. This confidentiality led to the non-publication of proceedings of the WHO Conference on Chernobyl, 23-27 November 1995. The 700 participants still await the Proceedings which were promised for March 1996. Dr Nakajima, who was Director General, WHO, at the time of the conference, confirmed in 2001, in an interview with Swiss Italian Television, that censorship of these proceedings was due to the legally defined relations between the WHO and the IAEA. Thus, it was the IAEA which provided the plans for a project requested by the Minister of Health of the USSR. This explains why genetic damage, known to be a critical measure since the 1957 publication of a WHO “Technical Report on the Genetic Effects of Radiation on Humans”, was omitted, while dental caries were accorded high priority. As a result, it is the promoters of atomic energy, the IAEA and its spokesman, the UNSCEAR, which depend for their recommendations on the self designated officials of the ICRP, which provide information to the United Nations on the health problems of Chernobyl. They cited 32 deaths from radiation in 1996. In 2005, they conceded 54 deaths and 4000 thyroid cancers in children - a fact which the IAEA could no longer contest, as it had done until 1995.
conference in 2001, we learned that 10% of these workers, half of whom were young military recruits had died, one third was invalid and the situation was deteriorating rapidly. The Ukrainian Embassy stated that 87,85% of the inhabitants of the contaminated territory were ill and that proportion increases every year. Hundreds of epidemiological studies in Ukraine, Belarus and the Russian Federation, have established that there has been a significant rise in all types of cancer causing thousands of deaths, an increase in infant and perinatal mortality, a large number of spontaneous abortions, a growing number of deformities and genetic anomalies, disturbance and retardation of mental development, neuropsychological illness, blindness, and diseases of the respiratory, cardiovascular, gastrointestinal, urogenital and endocrine systems. The health professionals, undersigned, join with the associations which have denounced this unacceptable situation for more than ten years now. We support those who have held a silent vigil in front of the WHO since 26 April 2007. With them, we demand revision of the Agreement (WHA 12-40) in order to restore independence to WHO in accordance with its constitution. We request that revision of the agreement be put on the agenda of the next World Health Assembly so that WHO can “act as the directing and coordinating authority on international health work”, “promote and conduct research”, and “provide information, counsel and assistance in the field of health” (Articles 2 a, n and q of the WHO Constitution) in the area of ionising radiation and the health consequences of Chernobyl, and in particular the health effects of chronic, low dose radiation from prolonged ingestion of artificial radionuclides. Your website is my absolute favorite because of what you do. The WHO is the reason I'm sick from wireless technology, too.